Kyle Larson drives the No. 42 Cartwheel Chevrolet to win the NASCAR Nationwide Series TREATMYCLOT.COM 300 at Auto Club Speedway. 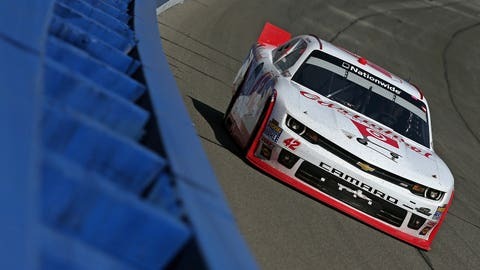 California native Kyle Larson held off furious late-race charges from Kevin Harvick and Kyle Busch to win Saturday’s treatmyclot.com 300 at Auto Club Speedway and capture his first NASCAR Nationwide Series victory. Larson drove a great race in his Turner Scott Motorsports Chevrolet to best Harvick and Busch, the latter of whom won six of the past eight races here. Joey Logano, who led a race-high 96 of 150 laps, was fourth in his Penske Racing Ford, ahead of Elliott Sadler. In the closing 15 laps, Busch and Harvick took turns applying suffocating pressure to Larson, but the youngster never flinched as he held them both off in dramatic fashion. It was an emotional first Nationwide victory for Larson, who had five second-place finishes in his previous 37 series starts. "It means the world to finally get it here in my home state of California," said Larson, who is 21 years old. "… Man, that was a blast racing out there, and I think it’s going to be a heck of a race tomorrow in the Cup car, too." Considering the level of competition he defeated, Larson was understandably pleased. "It’s pretty cool to beat those guys," he said. "The 54 (Busch) and 22 (Logano) have dominated this series for a while now and Harvick’s with a good team." Even the losers were happy after one of the most exciting races in recent memory. "We had a lot of fun there at the end," said Harvick, who drives for JR Motorsports in the Nationwide Series. "Obviously, you’d rather win the race, but any time you can be involved in a race like that and put on a show for the fans like we did there at the end, you have some satisfaction." "It was a great battle there, a fun race the three of us going back and forth and trying to figure out who wanted to win the thing," said Busch. "I know we all did. It was certainly fun. Congrats to Kyle … There shouldn’t be anyone happier than the fans in the stands." It was an interesting race from the drop of the green flag. First Harvick and then Joey Logano led the early going, but the real story was the charge by Busch through the field. Busch’s Joe Gibbs Racing Toyota flunked pre-race tech inspection, so he had to start at the rear of the field. It took Busch all of seven laps – three of them under caution – to race his way back into the top 10. By Lap 18, Busch was up to third place and closing fast on the leaders. He got to second on Lap 22, when he trailed Logano by about 4 seconds. Logano had a slow first pit stop on Lap 41, and that’s all it took for Busch to take his first lead of the day. At the 50-lap mark, Busch led Logano by 2.365 seconds, with Harvick third. But Busch began complaining his car was loose, and Logano started to reel him in, re-taking the lead on Lap 61. Logano led Busch by 1.894 sec. at the lap-100 mark, with Larson moving to second on Lap 103. After the final round of green-flag pit stops, Logano’s lead was up to 3.498 seconds over Larson on Lap 117. But in just seven laps, Larson cut that lead to just 0.434 seconds. With 25 laps to go, Larson caught Logano, but got blocked by lapped traffic. Soon the two were dicing furiously for the lead. A caution for fluid on the track on Lap 131 sent the leaders all down pit road. Harvick won the race off pit road, ahead of Larson and Logano. When the race restarted on Lap 135, Larson jumped out front, ahead of Busch and Logano. Then, on Lap 138, Busch dove under Larson but Larson came back and held onto the lead. Busch passed Larson on Lap 145, but got loose, allowing Larson to go back out front. And from there, Larson never flinched, holding on for the win despite intense pressure from Harvick and Busch. "It was amazing," said Larson. "Those last 11 or 12 laps were the longest laps of my life, to see the 54 (Busch) and the 5 (Harvick) behind me and they weren’t getting any further back."